More bodies have been discovered from a Congo boat accident earlier in the week, bringing the total death toll to at least 40, the country's interim minister told Reuters on Saturday. More than 100 people are still missing. Conway G. Gittens reports. 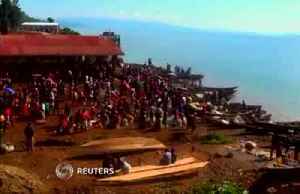 Congo's president says 150 people are reported missing after a boat sank on Lake Kivu in the country's east.